Tottenham fans travelling to tomorrow’s stellar Champions League tie with Inter Milan have been advised by the club not to take ‘Star of David’ flags into the ground, although both UEFA and the Nerazzurri themselves insist that they have no problem with the Jewish symbol being waved. Flags and banners with appropriate wording would be welcome at the Stadium, but the Police Authorities have advised that those flags showing the Star of David will not be allowed access and may be confiscated. k im confused why were they going to bring star of david flags? 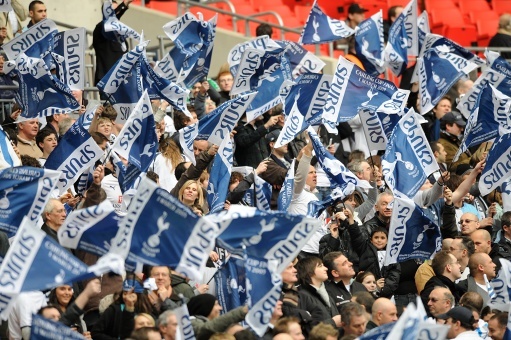 Tottenham are a club with a large (historically at least) Jewish support base, hence the fan’s appropriation of the ‘Yid’ nickname and the waving of ‘Star of David’ flags and banners on occasion. I guess the Italian police thought that a Jewish flag or two may be enough to incite Inter’s moronic Ultras. Is that definitely why? So as not to incite the fascists? Cos that’s pretty poor form! If they’ve read this same news it will probably do the same! The fact that UEFA have and would never do anything to curb these outright racists because they play in one of Sepp Blatter’s prefered leagues is the biggest piss take. Making a mockery of their own ‘Kick racism out of football’ campaign? Me thinks yes…. Italian football in general is shite. I remember reading about how far right Ajax fans took the star of david symbol purely because they felt it would create anger and confusion with opposing fans, very strange. maybe they shouldn’t wave the flag because most of the fans aren’t jewish. Why would you wave around such a profound symbol without fear of comeupance? Look at religion in football, it is almost always met with violence. I could never be a tottenham fan because i could never call myself a ‘yid’ when I’m not Jewish. Its a stupid nickname proliferated by tottenham’s moronic fan base. Agreed tom the ‘yid’ thing is a disgrace, even if you are jewish. I was certain that this insulting and scandalous nickname was referring to the Jewsih population of north London, who often historically supported WHL. However it has NO place in Football and waving Israel’s symbol around like a common football banner is an insult to the state of Israel and its supporters worldwide, even though the Spuds fans are mistakenly trying to actually compliment their Jewish historical associations. Lets leave politics and religion out of Football…there is already enough shite destroying the game we all love.